Sparkly diamante buckles are sooooo versatile for all sorts of cards so here’s a few samples. 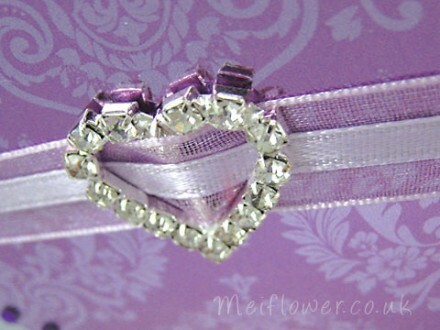 I used a heart shaped diamante buckle to make a purple themed card. The backing is a metallic mirror card from Kanban, if you look closely you can see the back of the diamante buckle reflecting in the card. I also added some purple gems to decorate the card. I had this lovely organza ribbon lying around in my craft stash, as you can see the ribbon fits just perfectly. Tracey made a wedding card using the heart buckle. As you can see you don’t always need to use ribbon that fits perfectly. Wide organza ribbon works perfectly as it is quite soft and easy to work. All you do is simply slide the ribbon through to give it a nice ruffled effect. Tracey used ivory chiffon ribbon for her card. 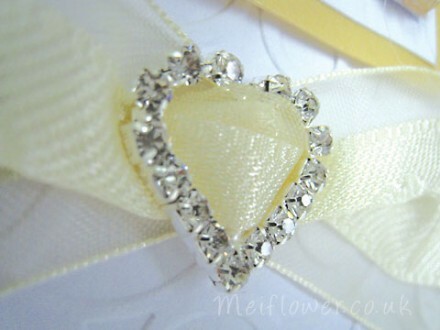 Diamante buckles with ivory organza ribbon. To be honest, i have bought other ribbon sliders in the past and the quality hasn’t been too great, I’ve had these buckles specially made for me. You’ll notice that each diamante gems is individually set. Also the back of the buckles are a nice silver which gives the gems more of a sparkly shine! Finally . . . . not only do i use these for my cards, my friend recently got married so i wrapped her present with some organza ribbon and what better to finish off the box than a diamante buckle to tell her how much i love her. I think the chocolate organza ribbon works really well and looks absolutely gorgeous. I’m very happy with this ribbon as it holds its shape really well, I’ve used some before and it was really floppy this also cuts well without fraying. This entry was posted on Thursday, August 11th, 2011 at 8:28 pm	and is filed under Birthday Cards, Wedding Cards. You can follow any responses to this entry through the RSS 2.0 feed. You can leave a response, or trackback from your own site. Wonderful post. 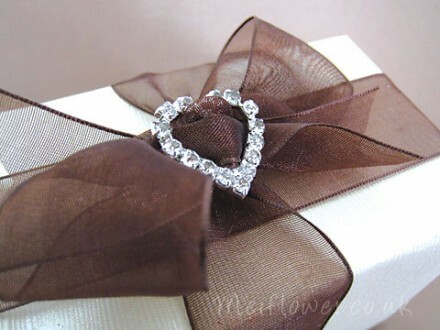 I really like the way you’ve used the chocolate coloured ribbon, works really well with the shiny buckle. Personally i would have used narrower ribbon but the wide chiffon ribbon actually works very well. Think i’ll try this today. 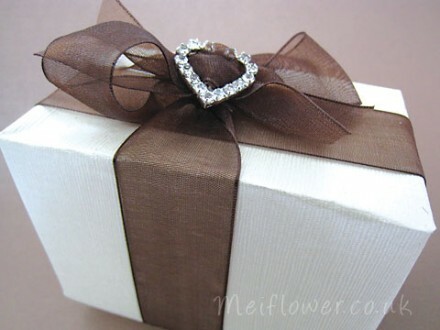 Some lovely ideas you have given me, never thought of using them on presents loving the chocolate ribbon! Wow-wee I recieved my diamante buckles today and I only ordered them yesterday didn’t expect them to arrive so quickly . . better start making my cards then. 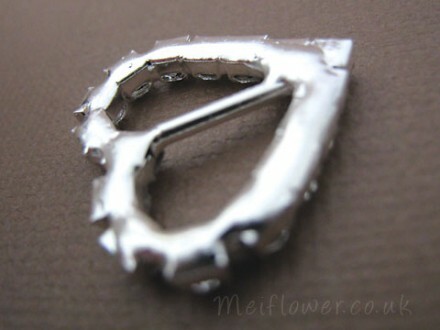 Just receive my diamante buckles as well – fantastic, very happy with purchase, it was my first order with your company. Think i’ll buy some of your ribbon now. I bought 60 of your heart buckles for wedding invitations. When looking for these I found a lot which looked good in pictures but the info said they were plastic. They were even more expensive. I liked the look of yours and was delighted to see them for real They worked very well in the wedding invitations. The invitations have just been posted 2 days ago but I am already receiving praises. The buckles definitely added a touch of class. I am now hooked and will probably use them on all my cards. The service was excellent. I received my order very quickly.I will be shopping here again and will recommend you to my friends.